WTI crude oil prices have seen a tremendous rebound from their 13-year lows in February. As of 1:05 p.m. today (Friday, June 3), the U.S. benchmark has rocketed 85% to $48.42 a barrel. Despite the meteoric rise, WTI crude oil is still shockingly cheaper than the actual 55-gallon barrel that holds it. According to Uline, one of the biggest North American distributors of shipping and packing materials, one 55-gallon, 37-pound steel drum used for oil transport costs $89 before tax. That's an 85% markup from the price of crude oil today. And there are many more ordinary items that are surprisingly more expensive than a barrel of crude oil right now. One barrel of WTI crude oil costs less than… a half-keg of domestic beer. The average cost for a standard keg (about 15.5 gallons) filled with Budweiser beer is about $100. That's twice as expensive as a barrel of WTI crude. Drink up. One barrel of WTI crude oil costs less than… a LifeProof iPhone case. The cheapest LifeProof case – known for being waterproof, dirt-proof, snow-proof, and drop-proof – for Apple Inc.'s (Nasdaq: AAPL) newest iPhone 6 costs $79.99. In other words, this phone case sells for a 65% premium to a barrel of U.S. crude oil today. 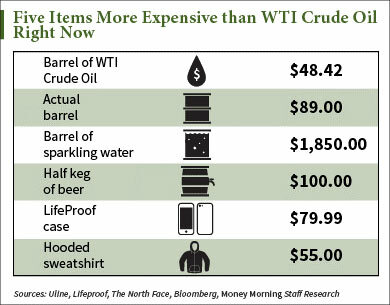 One barrel of WTI crude oil costs less than… one sweatshirt from the North Face. A men's hooded sweatshirt offered by the popular outerwear and apparel retailer sells for an average price of $55. That costs 13.6% more than today's WTI crude oil price. One barrel of WTI crude oil costs less than… a barrel of sparkling water. According to Bloomberg reporter David Ingles, a 55-gallon barrel filled with Perrier Sparkling Natural Mineral Water would cost roughly $1,850. That's more than 38 times more expensive than the price of crude oil today. 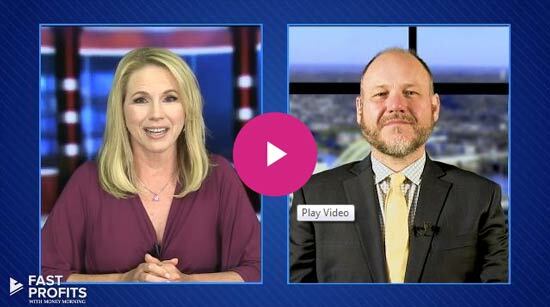 Alex McGuire writes about the oil market for Money Morning. Follow him on Twitter for the biggest energy news. If you were buying 12 million barrels a day you would get them for about 10 pounds stirling or less. i have bought teflon lined barrels in small amounts for 35 euro delivered. so your are having us on or someone is having you on Alex. They don't actually store crude oil in Barrels, it is just a unit of measurement. I hope that the author of this piece knows this.